The Ford Mustang is a really well engineered Vehicle. There have been many different types of mustangs manufactured since the first production year in 1964. Here we are going to share what a SVT Cobra, and an SVT Cobra R is. First off, SVT stands for Special Vehicle team. The special vehicle team develops the higher performance vehicles for Ford, and the Cobra is just one of many that they develop. The cobra was introduced in 1993, and has limited production. Performance wise the cobra is very impressive, since it used Ford’s GT40 high-performance engine equipment. The Cobra R, which is a race spin off of the Cobra was also produced in the same year. Its features were more or less for racing purposes only. In fact the Cobra R does not even have a stereo or air conditioning system within the car. So if you are looking for an enjoyable cruise sports car the Cobra R is not it. 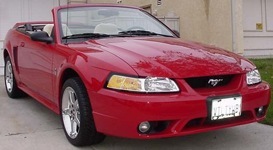 In 2000 Only 300 SVT Cobra R Mustangs were built and they all came in Performance Red. There were no general SVT Cobras built in 2000. 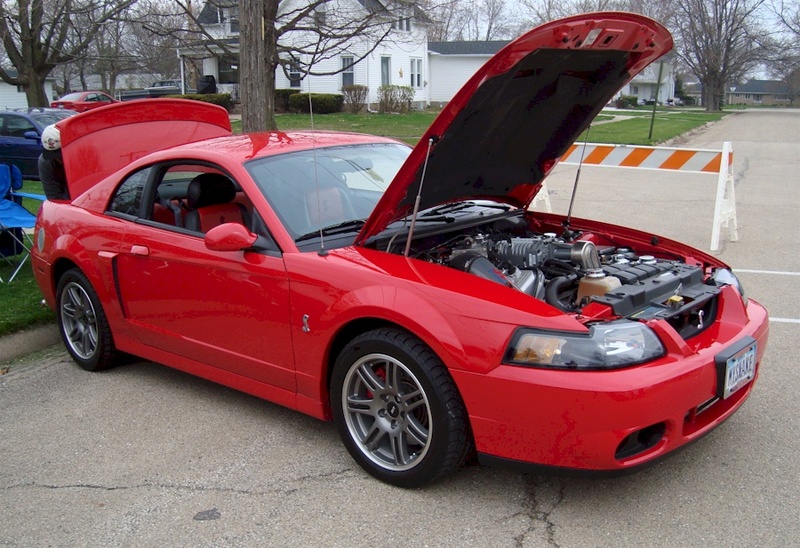 The Cobra R came with a 5.4L V8 engine that put out 395 horsepower, Canton 8-quart oil pain, McCleod aluminum flywheel, a Tremec T-56 6-speed transmission, 4 inch aluminum drive shaft, 8.8 inch short shaft 31-spline fully independent rear suspension, Brembo 4-piston calipers with 13-inch rotors, Eibach 800lb/750lb springs, Bistien shock absorbers, Borla mufflers with side exit exhaust, and Recaro seats. 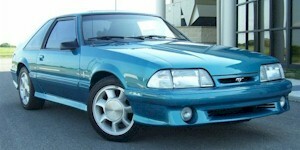 Now back to the Cobra, in 1993 is when the World seen the introduction to the SVT Cobra. The SVT Cobra had a modified body panels, better handling, and 235 horsepower. The front grille is similar to the GT, but the top has an opening with a horse emblem and the lower has removed side scoops. The rear was a one piece design with exhaust cutouts and a special trunk lid spoiler. Come 1994, the second year of the Cobra you could now get it in the coupe or convertible. 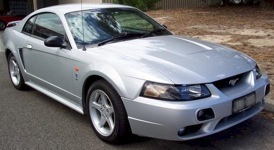 It had a new front fascia with integrated fog lamps, cobra snake emblems, a custom rear spoiler with built in LEP lamps, better handling, and V8 engine which pushed out about 25 more horsepower for this Pretty Pony! 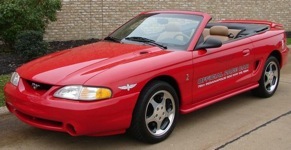 Fun fact, All 1994 Cobra convertibles were Rio Red Indianapolis Pace Car replicas. 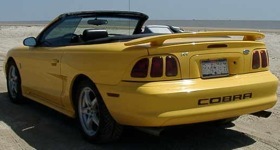 The 1995 Cobra was pretty much a do over from 1994 except for the SVT emblem on the trunk lid. 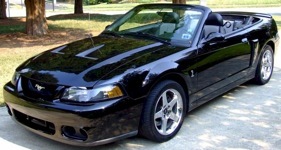 The Cobra R came with 300 HP, 5.4 L V8 engine with better handling options. 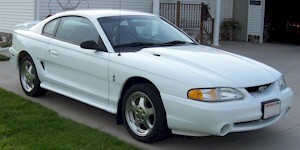 The 1995 Cobra R only came in Crystal White. In 1996 the Special Vehicle Team was trying to one up the Cobra that was previously produced, and Boy did they. It came with a 4.6 L 32 Valve double overhead cam V8. They also introduced a Cobra exclusive color, Mystic. (Shifts from blue to purple, to green, and black.) To have the Mystic colored car that was an extra $815.00 back in 96. 1997 Came with few but limited amounts of changes from 96. The grille opening was enlarged and a new color, Pacific Green, was offered. Optional equipment continued to be limited to just the Preferred Equipment Package (Mach 460 sound system and leather seats) and the rear deck lid spoiler. Again, for 1998 the Cobra seen few but limited changes from 97-98. The SVT Cobra in 98 consisted of the following, yellow paint was available, a new 5-spoke wheel design was used, the under-hood tower brace was redesigned, and there were a few interior changes. Standard equipment was ABS, sport seats, the premium sound system, power equipment, rear window defroster, AC, cruise control, floor mats, lighted visor mirrors, and key-less entry. Optional equipment was few; extra interior leather trim and a rear spoiler. 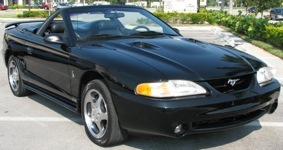 In 1999 the Cobra had a redesign to the mustang platform. The 4.6L engine was altered to 320 horsepower. The 1999 Cobra received a new independent rear suspension. Another new 5-spoke 17-inch was introduced. Out was yellow and blue paint, but in was a green paint. 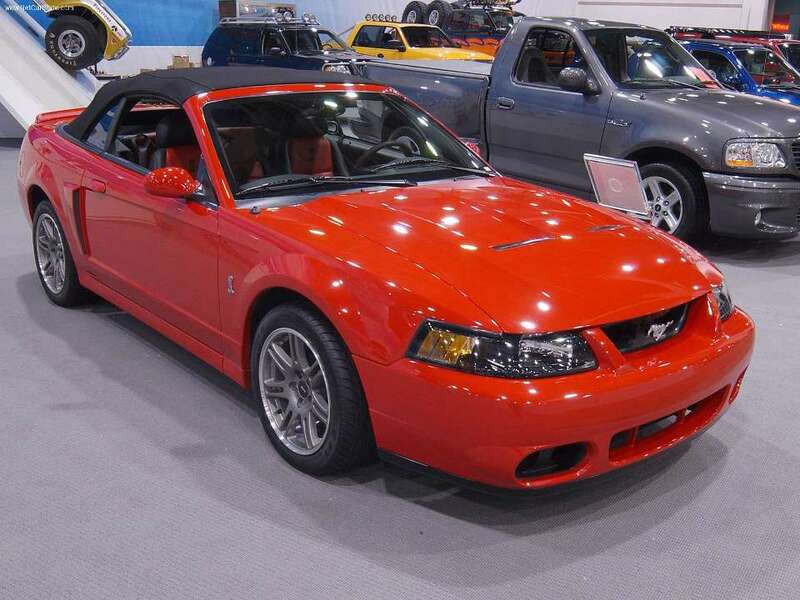 2000 there were no SVT Cobras, only the SVT Cobra R. But as previously stated there were limited numbers produced and only came in Performance Red. 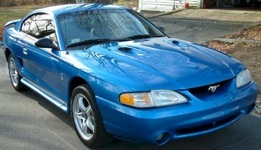 In 2001 the SVT Cobra basically had no changes over the 99 model. It came with a 325 HP, 281 cubic inch, 4.6 L, electronic fuel injected, double overhead cam, V8 Engine. It had 8 colors to choose from, sport seats, power equipment group, rear spoiler, polished wheels, and Cobra letters embossed into the rear bumper. In 2002 the United States didn’t have the chance to experience the SVT Cobra. Only 100 units were produced all of which were shipped to Australia. Its features included 320hp, 281 cubic inch, 4.6 liter, electronic fuel injected, double overhead cam, V8. 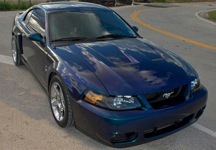 Just like 2001 the 2002 Cobra came in 8 of the standard 2001 Mustang colors, sport seats, power equipment group, rear spoiler, polished wheels, and Cobra letters embossed on the rear bumper. Since they all went to Australia the tweaks included fender reflectors, extra driving lights in the front bumper, and right-hand-drive. 2003 brought on a whole new beast. 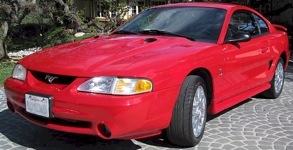 The 2003 Cobra was so different, and the Special Vehicle Team knew it was something special they nicknamed it the “Terminator.” (Yes on purpose) They said that it “Terminates any and all competition between the Cobra and the General Motors Trans Am and Camaro models. So what’s so special about this year versus the other years you ask? Well I’ll explain that to you. The engine consists of a hand-built 4.6L, double overhead cams, Supercharged V8. This engine is a real beast, with 390 horsepower and 390 foot-pounds of torque. Yep, we just said that! It was offered in both the convertible and coupe body styles. Aside from the original Cobra, there was a 10th year anniversary Cobra. 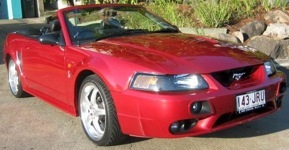 In addition to what the original Cobra had to offer the 10th Anniversary came with, carbon fiber patterned leather on the top of the steering wheel, carbon fiber leather on the shifter and hand brake, red window switch bezels, red seats inserts, red painted brake calipers all the way around, and big 17×9 inch 10th Anniversary wheels. Offered in both coupes and convertibles the exterior colors were limited to Torch Red, Silver, and Black. Fun fact for the 10th anniversary, There were 1,003 Coupes made and 1,000 convertibles made. 2004 the Cobra cam in a coupe and convertible. It included 390 horsepower 4.6L double overhead cams, Supercharged V8 engine, inverted dual hood scoops, a unique front bumper, lowered spoiler, 6-speed manual transmission, and unique 17-inch chrome aluminum wheels. The Mystic chrome paint was also available on the 2004 Cobra model only. Fun Fact, it was only offered in the Manual transmission. Prestige Mustang started in Atlanta GA in 1983 in a spare bedroom of a duplex. The next location in 1984 was a tiny one-bay garage. After a few turbulent months there we managed to land a 5 bay garage space in Decatur GA. In 1987 we moved again, this time to a 4,000 sq. ft. warehouse with outside parking for parts cars. In 1989 we secured a new lease that was converted to a purchase in 1991 of a warehouse property in Clarkston GA. While we operated in this location we expanded our operations to include Mustang car sales, a full Mustang only recycling facility, new and new old stock Mustang parts sales as well as a complete Mustang paint, body and frame restoration shop. The footprint was only 1-½ acres but it housed about 20,000 sq. ft. in covered warehouse and shop space as well as room for about 100 Mustang parts cars. Over time, the direction of the business turned away from paint and body restoration to focus primarily on parts sales. In 2010 It was obvious that we had severely outgrown our space. After a diligent search, we purchased our new facility and in the next five months we renovated our new space and moved our entire operation into a very large warehouse building located at 785 Adamson Drive Monroe, GA 30655. Our new location is conveniently located on the East side of Atlanta - close to the Athens UGA campus (Go DAWGS!) and just minutes away from one of the main UPS hub routing stations. We have verified the fact that we can rightfully claim the title of being the worlds largest antique to late model Mustang only recylcing facility.We specialize in antique to late model parts. We currently own five acres with an option to expand to up to 15 acres and add several more buildings as we grow even larger. Our main building is 29,000 sq. ft. of covered warehouse and dismantling space with industrial steel rack mezzanine shelf storage. We do not store parts cars outside for long periods of timeWe offer a full service mail order supply of new-old-stock, early & late model, as well as rare antique Mustang parts that we ship to Mustang enthusiasts worldwide. We strive to fill the gap between the years that the parts go obsolete from the manufacturer and new licensed reproduction parts are produced. Unfortunately, many parts are never reproduced and there are many different levels of repro parts, some are magic and some quite tragic. Many reproduction parts are simply not acceptable to refinishers and purists who would never consider installing parts on their pony car that were not made in the USA. Since we understand and share this mindset, we can cater directly to the need of those discriminating individuals. Some of our favorite Mustang year models are now considered "antiques," but after more than 31 years in this business, we have found that some things never change and providing excellent customer service is still our number one priority. Is there a 2018 Ford Mustang Bullitt Coming? My thoughts (as a woman) on “The very best mistress your man could ever have”!